As Jane begins to piece together the answers to the puzzle, she must find out why she was brought to Birch Grove and what she would risk to stay there..because even the brightest people make terrible decisions when they are offered the things they desire most. 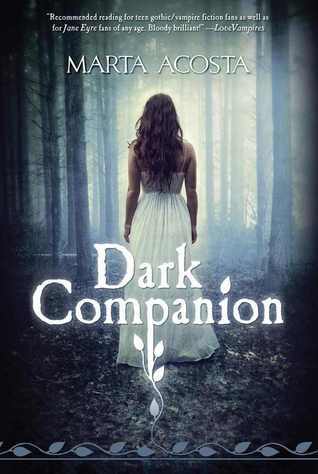 I originally picked up Dark Companion for two reasons: the gorgeous cover, and the comparisons to Jane Eyre. Unfortunately, while I did enjoy some parts of the book, I was left mostly underwhelmed. The writing! It was really lovely and well-done, and had very Gothic, dark tones which appealed to me a lot. The book could definitely be a little creepy (and weird) at times, especially when the author was describing the gloomy, dreary school, but it worked. Sometimes it risked feeling a little too gloomy and drab, but all in all, the writing was a plus. I also really enjoyed reading about some of the characters, with the exception of a few. Jane herself was kind of hit-or-miss with me…sometimes I felt myself empathizing and cheering her on, and sometimes I wanted to slap her upside the head (especially the way she let some of the others treat her). The best characters for me, however, was her best friend, Mary Violet, and the love interest, Jack. Mary Violet in particular was hilarious, with her quirky poetry and odd way of speaking/behaving. Jack was kind of an oddball, and while I’m not sure he’ll go into my list of favorite book guys, he was interesting and well-developed enough. Lucien, or Lucky as he was called. Oh my gosh. He was so creepy, so abusive, and so weirdly possessive. I hated the way he treated Jane, and even worse, I hated that she let him! For a good chunk of the book she practically worships him, which I absolutely couldn’t stand, especially when his brother Jack was clearly the better choice. Speaking of Jack, the romance wasn’t all that great either. Jane spends most of the book fixated on Lucky while ignoring the obvious signs that Jack is into her, in a kind of forced love triangle that didn’t really work (mostly since Lucky was a creep and clearly not a viable choice). And then when she finally does open her eyes and realize that Jack has been there all along…it feels really sudden and rushed. There was definitely some sweet moments between the two of them, but I just wasn’t feeling it, despite really liking Jack’s character. And lastly, I can’t say much without giving away spoilers, but basically the plot gets really weird really fast at a certain point, once Jane starts to figure out what Birch Grove’s big secret is. It was a little (okay, a lot) strange and I’m just not sure how much I’m willing to roll with it. Especially where Lucky is concerned, yuck! Again, I can’t say much…but I will say that it was definitely a little disturbing. All in all, while there were some aspects of Dark Companion that I thoroughly enjoyed, the book didn’t quite live up to my expectations. It was a little too creepy in some parts and a little too bland for the rest of it. Some people might totally love it, but it just wasn’t my cup of tea.